Now only a courageous and clever tailor girl can see beyond the rumors to save the kingdom (goodreads.com). I picked this up at my local library in the new releases section because it looked pretty interesting. I have only read a couple of fairy-tale retellings and I am always looking for more. I wasn’t sure if I was going to like it, but I was definitely wrong! This is now on my favorites list! 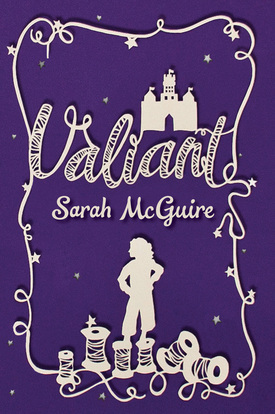 Valiant is a retelling of the fairy-tale, A Brave Little Tailor, in the perspective of a young girl who must take over her father’s tailoring business (though she hates it) in order for them to make a living after her father becomes ill. Women are not allowed to be tailors so she has to hide her identity by becoming a boy. After working for a few weeks, Seville meets Will who is a young homeless boy fighting for his life out on the streets. She takes him in and cares for him in return for doing chores and helping with the business. Eventually, Will finds out that there is an army of giants heading towards the city and he ventures out beyond the walls. Seville loves him dearly and risks her life attempting to rescue him by outsmarting the giants (relates to the original fairy-tale) who she finds are not all the unintelligent. Upon returning to the city, she is made out to be a hero, but a lord realizes that she is not who everyone believes her to be and tells her to go with him to protect her from the crowed. This is where the story really gets good. Together they attempt to figure out how to stop the army from taking over the city. The plot is amazingly well done! There was so much information about Seville and Will before the plot really picks up speed, but it was just so engaging the entire time! I just couldn’t put the book down. There were several moments when I was on the edge of my seat reading this one! Very exciting! I was hooked on the book from the very first chapter and it just kept getting better and better. It even had a fantastic ending! Within the novel there arises a bit of romance, but nothing at all the would be inappropriate for young children. I would describe it as fairy-tale like romance that builds throughout the story and has a happily ever after ending! I really enjoyed Seville as a character. Throughout the novel we learn a lot about her and it becomes very personal when we take a look at her relationship with her father and hear about her memories of her mother. Seville is a strong, brave, not to complex, female lead character that we don’t get very often in books. She also has a great, caring personality, is fantastic at her job even though she dislikes it, and sees things that others miss. I thought she was very personable, easy to empathize with, and I love how she grows as a character as the story progresses. Very well developed! Will is also a great character and one of the cutest little boys you will ever meet! He is also easy to empathize with, is caring and brave, and loves to find and fix things that others cant. Lord Verras, the King’s cousin, is an interesting character and he cares deeply for his city, more so than I would say the King even does. He is caring, brave, and hard-working, but can sometimes be too cautious. Even though we don’t learn a lot about him I still found myself falling in love with him. He just had that lordly air about him. He spends a lot of time with Seville and I adored watching their relationship develop and his character unfold. Eventually, we start to see him become rather over-protective of Seville. Overall, I enjoyed all the characters! Even the giants and some secondary characters had their own personalities and were very interesting. I thought the writing of the novel was fantastic and easy to follow. There were plenty of descriptions, information, and everything written was in some way important to the story. Anyone who adores fairy-tale retellings or fantasy in general will love having this book on their shelf. The story is interesting, engaging, and definitely a real page-turner. I couldn’t put the book down. I know you will love it if you give it a try! A great book for children eight and older, but everyone will enjoy it! I look forward to more books by this author!